Democratic Sen. Heidi Heitkamp of North Dakota suggested Friday she may vote no on Brett Kavanaugh's confirmation to the Supreme Court, saying: "There are a lot of lawyers in America who can sit on the court." Heitkamp said she hasn’t made her final decision, but her comments to the AP provided insight into her thinking. “I think this idea that there’s only one person that can do this job, we all need to recalibrate,” she said following a campaign stop in Grand Forks. Ford told the committee that Kavanaugh barricaded her in a bedroom at a gathering when they were in high school and assaulted her. Kavanaugh denied the allegations in fiery testimony. 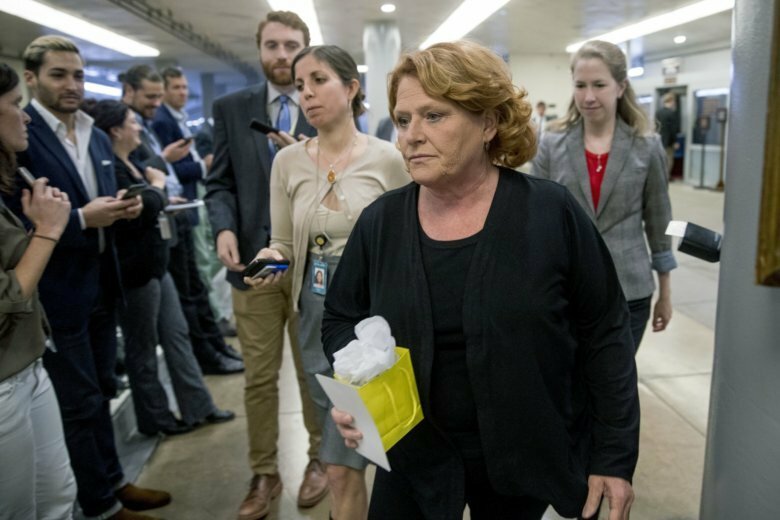 Heitkamp is one of the most vulnerable Senate Democrats seeking re-election this fall, running in a state that supported President Donald Trump in 2016 by 36 points. Her opponent, Republican Rep. Kevin Cramer, supports Kavanaugh’s confirmation, adding pressure on Heitkamp. Her Supreme Court vote choice is being closely watched, along with other moderates who have not yet announced their decisions. Two other Democrats facing tough re-election fights, Sen. Bill Nelson of Florida and Joe Donnelly of Indiana, said Friday they’re voting no. Heitkamp was one of three Senate Democrats who voted yes on President Donald Trump’s first Supreme Court nominee, Neil Gorsuch. She pointed Friday to what she said were distinctions between Kavanaugh and Gorsuch, who is from Colorado and served on the appellate court in Denver. She said Gorsuch wrote eloquently in legal opinions about issues that are important to people from outside of the East Coast, including water rights and tribal sovereignty. Kavanaugh grew up in suburban Maryland and is federal judge for the U.S. Court of Appeals in the District of Columbia circuit. “One of the criticisms I have had about appointees is they don’t all have to come from Harvard and Yale and they don’t all have to come from prep schools,” Heitkamp said. “They can come from the West,” she added, where people have “different sensibilities” about issues such as guns and water. “We need people who come from different backgrounds,” she said.